For quite some time I thought that pairing was a really overblown concept, designed to further mystify the world of wine and keep it just for the snobs. Hey, if you want to drink a bold California Cabernet with whitefish, well, you just go ahead. Chablis with Chipotle-marinated flank steak? Do it…it’s all about what you like, right?! How wrong I was. There really is something to this, and it can really help you enjoy your food and wine much more than you might imagine. And don’t take my word for it, check it out: try that fruity, tannic Cabernet with halibut in a lemon butter and caper sauce. The wine will walk (swim?) all over the fish and you won’t enjoy – or even taste – the fish, and the wine won’t be very pleasant, either. So if you want, you can pair your meals with wines that overwhelm the food, or that are overwhelmed by it. Or you can find wines that improve the taste of the food, and allow you to really enjoy and appreciate the wine at the same time. For example, go Italian. What do I mean? Well, simply, pair penne pasta with fresh tomato and basil sauce with a hearty Chianti. This is a way of “going regional”- like pairing Beef Bourguignon with Pinot Noir. But you can also over-think this and spend way too much time wringing your hands or putting your nose in expensive books about the subject. And if you spend your days searching for the “perfect” wine you’ll be disappointed…there is simply no such thing. In the meantime, you’ll waste the enjoyment you would’ve had pairing food with wine. Take a look at the Wine & Food Pairing Guide at the bottom of this page. I don’t pretend that this covers it all, or that some people won’t disagree with my choices, but you could do worse than this to start. First, the conventional wisdom of “white with fish and poultry, red with meat” is not only simplistic and incomplete, but it’s also often wrong…and boring. For example, turkey is poultry and yet pairs nicely with dry rose, or Pinot Noir, or maybe a Beaujolais. And each broad category of wine has a number of variations based on body, fruitiness, residual sugar, acid, tannin and other elements that further complicate picking the right wine, because they interact with flavor elements in the food, affecting both. For starters, don’t overlook Champagne and sparkling wine as great accompaniments to food. Blanc de Blancs made primarily from Chardonnay complement the classic starters, to be sure – oysters, caviar, sushi and sashimi – but they also work well with most white fish and many main dishes that are salty, vinegary and spicy. Rose and Blanc de Noirs Champagnes and sparkling wines on the other hand go better with red fish, veal, some game meats and perhaps even roast beef, if it’s not well done or charred. Imagine that! And don’t disregard what you’ve learned about food your entire life when it comes to wine pairing. You know you’ve always said that chicken doesn’t really have a taste, but rather it tastes like what you put on it – barbecue sauce, lemon butter, or peanut sauce, for example. So even though chicken is “white meat” you could pair the BBQ with a zesty red Zinfandel, the lemon butter with a oaky Chardonnay, and the peanut sauce with a slightly sweet Kabinett Riesling. As you’re thinking about what wines to serve – and you should select your wines first and then pair the food with them – keep in mind that American wineries generally label wines by the grape that makes up the majority of the wine. Much of the rest of the world labels wine by place name, though, so, you may have to know a little about wine place names in order to make some headway when pairing with European wines. One thing – and I don’t want to prejudice your tastes too much here nor turn you off to certain wines. But the most food-friendly wines are those that don’t overpower the food, even if the pairing seems natural. For that reason, some over-oaked Chardonnays and big, bold Cabs are really tough to pair and are better enjoyed by themselves. Below are a few points to make your wine-food pairing choices easier and more appropriate. And don’t forget to visit the “Fun Stuff” tab for the Wine-Flair Wine & Food Pairing Chart! There are few hard and fast rules, and each person’s palate may dictate pleasing food and wine combinations different from yours. However, there are guidelines that are very reliable and help ensure that you have an enjoyable experience. Heed them…there’s real science and years of experience behind them! You can drink red wine with a delicate white fish, but you likely won’t enjoy – or even taste – the fish if you do. Wine itself is food, so start thinking about pairing in those terms. You wouldn’t drink beer with your corn flakes… or would you? When serving multiple wines, a rule of thumb is white before red, dry before sweet, delicate wine with delicate food, and full-bodied wine with hearty food. Wine that is high in acid reduces saltiness, so sparkling wines pair well with salty foods (e.g. caviar) better than less tart (most red) wines. Balance sweetness and intensity of flavor of wine and the dish being served. And where desserts are concerned, make sure the wine is sweeter still, or it will taste bitter or thin…or both. Keep in mind that the “same” wines come in many styles – a crisp, steely Chablis, which is Chardonnay, can be markedly different in character from a California Chard, which will often be oaky, buttery, with lots of vanilla and caramel and even some perceptible sweetness. Try to match flavors – a buttery Chardonnay with chicken in a butter creme sauce; an earthy Pinot Noir with stuffed Portobello mushroom caps. Don’t neglect Rose wines…they are perfect with an amazing variety of food. There are some outstanding wines that you won’t typically find on any pairing guide – for example, 100% Petit Verdot (such as the outstanding PV from Murphy-Goode), and other unusual varietals such as Carignane, Semillon, Melon (Muscadet), Tannat (Montus), and Pinotage. Experiment with these when cooking at home, or even at a restaurant when you are not entertaining guests and you will find some nice surprises! Some wines, particularly those from France, Italy and Spain, come in many blends or combinations, so understanding how and when to pair them with food does require some reading and effort. Red Chateauneuf du Pape, for example, may contain as many as thirteen different grapes under French wine laws including Cinsault, Counoise, Mourvedre, Muscadine, Syrah, Terret Noir, and Vaccarese, although the blend is based on Grenache. When in a restaurant, if there is a Sommelier, take advantage! They are there to help you find not just a great wine, but one that perfectly complements your meal. Consulting the Sommelier demonstrates that you are an astute consumer, not that you are a wine novice. And with rare exceptions, Sommeliers will not automatically steer you to more expensive options unless you show a desire and willingness to part with the greenbacks. In any event, never feel compelled to do that. The more you learn about wine, and the more wines you taste (and remember), the better you’ll be able to make choices that are both interesting and complement your food. That is why it is helpful, if not always convenient, to write down your impressions as you taste wines with food. 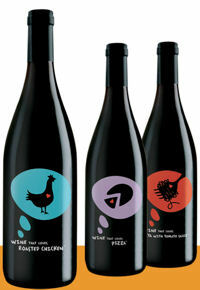 In a pretty clever marketing ploy, the San Francisco-based Amazing Food Wine Company has created Wine That Loves – wines named not for the grapes in them but for the foods they are meant to be drunk with: pizza, steak, grilled salmon, roast chicken, and pasta with tomato sauce. Wines for grilled chicken, Chinese food, and macaroni and cheese are in the works. They’re really doing it differently. For example, the typical back label, which on many wines says what the grape varieties are and in what percentages, is entirely missing. Instead there are explanations of the wines intensity, acidity, tannin, and flavor, as perceived by the company’s master taster. No vintages are listed, either, so in fact, you really don’t know what or “when” you’re getting. And all you do know is that someone who (presumably) knows a lot about pairing has done his or her homework. This, of course, takes the guesswork out of pairing for a lot of folk but may actually create some guesswork – and some skepticism – among others who want to know what they’re buying.